Here is your daily weather report. Lagos: Temperature, 25°C - 31°C with 65% chance of rain. Abuja: Temperature, 19°C - 30°C with 8% chance of rain. 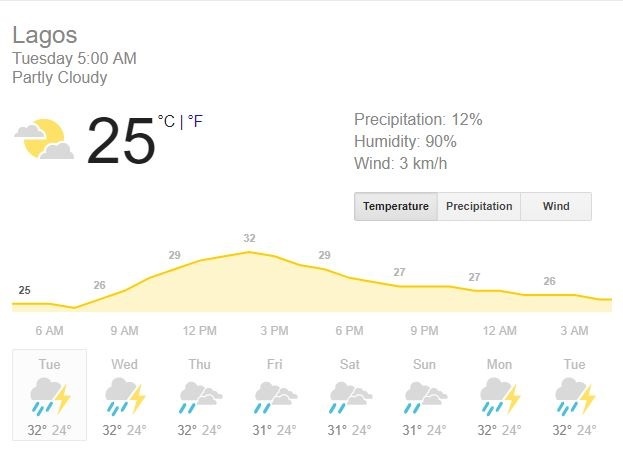 Port Harcourt: Temperature, 20°C - 25°C with 57% chance of rain. Ibadan: Temperature, 23°C - 32°C with 65% chance of rain. Kano: Temperature, 16°C - 38°C with 0% chance of rain.